And speaking of burying grounds, when the pressures of the Twentieth Century become too great to bear, who needs a tranquilizer when there is Paran Cemetery to visit? In the spring when the sun is sifted through the lacy canopy of live oaks into patches of light and shadows on the blossoming azaleas which color the carpet of sand and stones, many would think the pioneers' burial ground is at its loveliest; but to the writer, it is lovely anytime. It is a peaceful, silent place—silent until the twice-a-day train rumbles by, once by day and once by night. Otherwise, the stillness is unbroken except for the hammering notes of a pileated woodpecker shattering the silence at the edge of the clearing, or the haunting sounds of a sandhill crane echoing from the prairie, a crescent of color and activity separating the knoll and the site of Paran Church from the rest of the world. Its only link with the present is the sandy road leading from the Putnam Hall-Grandin highway and back again, and this narrow ribbon of road seems to disappear behind those who venture into the earthly paradise. The densely wooded knoll must have been like a steeple of sand stretching heavenward above the prairie mosaic and gently rolling terrain on which the first settlers had chosen to build their homes and lay out their farms. It was here, beyond the reach of their everyday lives, they came to worship and to bury their dead. The inscriptions on the grave markers are sermons in stone, and the slabs with the names so carefully recorded, each with its span of years, are stone pages of history. People who once lived have been filtered through death into names on stone, and the shadows of their lives stretch into memories and disappear a little deeper into oblivion with each passing generation. 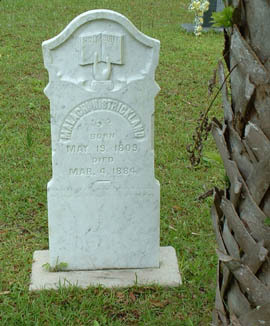 Of the three Elders who constituted Paran Church, only Malachi N. Strickland is buried in the churchyard; however, graves of many members of the Timmons family are found near those of their neighbors, the Walls.